If you sneer at the idea of paying to extend the warranty on your smartphone, click away now. I admit that AppleCare+ won’t pay to replace your iPhone if you use the phone in your bid to win the 2012 Darwin Award. But I know that it will make all sort of troubleshooting, repairs, and replacements a lot faster, easier, and cheaper. The reason I’m making a fuss about this is that if you pre-ordered an iPhone 4S you probably weren’t offered the option of purchasing AppleCare+. The option wasn’t available on the Apple website during the first wave of orders, and it wasn’t offered by AT&T, Sprint, and Verizon. This is a problem because AppleCare+, which covers accidental damage to the phone, must be ordered at the time the phone is purchased. AppleCare+ will be available through November 14, 2011, to customers who pre-ordered iPhone 4 (8GB) and iPhone 4S. 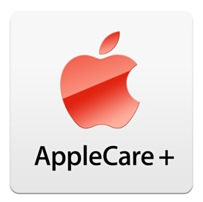 After you receive your new iPhone, contact us at 1-800-275-2273 to purchase AppleCare+. This entry was posted in iPhone 4S, Uncategorized. Bookmark the permalink.